Going into business for yourself is not always as easy as it may at first seem. Entrepreneurs often have to overcome various challenges before their companies become successful. Professional corporate branding, i.e. developing a company brand with high recognition value, is an important foundation for the success of any business. With the right promotional items, you can address customers in the appropriate tone and create authentic branding. From small individual enterprises to industry giants – branding is important for all companies. The aim of corporate branding is to raise awareness of the company as a brand. The brand should generate a recognition value and evoke an automatic, positive association in the (potential) customer. Successful corporate branding brings with it a number of advantages for the company. Firstly, potential customers are more likely to trust a brand with which they are already familiar. Secondly, once a company has successfully established a brand, they can ask and justify significantly higher prices. Good branding is also important in the field of search engine optimisation because Google ranks well-known brands higher, making it more likely that the company website is found. Professional corporate branding (which includes appropriate promotional items) also boosts customer loyalty, helps you stand out from the competition, increases awareness of the company and strengthens your employees’ sense of belonging. Are you a fledgling entrepreneur and are looking to build a company brand? The first step is to develop a concept that includes all the key aspects of branding: these include logo design, potential company names, office stationery, business cards, and online and social media presence. You should also analyse your competition’s branding material. It often quickly becomes clear that a particular style of design featuring certain shapes and colours dominates in any given industry. You can certainly use that as a starting point, but you should really create something that is unique and suitable for you and your company. Once you have found an “identity”, it’s time to implement it and to further develop your corporate image, for example by selecting the right promotional items. How can promotional items help with branding? Do you want to raise your company’s public profile, gain new customers or introduce a strong brand with which your staff can identify? This is where ADLER’s promotional gifts come in. When used correctly, promotional items for corporate branding produce a positive and lasting impression, and provide real value for the recipient. A small gift (for example, a stylish pen with your new logo) will be used every day and will generate an enormous amount of goodwill. If you reach your customers in this way and convey a feeling of genuine appreciation, you are already well on the way to success. Never underestimate the power of high quality. An impressive promotional gift featuring your name that continues to serve your customers well years later due to its exceptional quality will inevitably be associated with the good quality of your product brand. Stylus: this practical promotional item has the advantage of combining two everyday objects that are used by lots of people. The stylus is both a standard pen and a touch-pen for smartphones and tablets. This gift is modern, stylish and will be warmly received by target groups in the business domain in particular. With your printed or engraved logo, the stylus is a perfect promotional item for serious branding. Hand towel: a soft hand towel is a luxurious gift that every recipient will appreciate. Customers who enjoy using your hand towel will always think of you and your company in a positive light. Organiser: no matter what the personal interests of your target group, a handy organiser always goes down well. 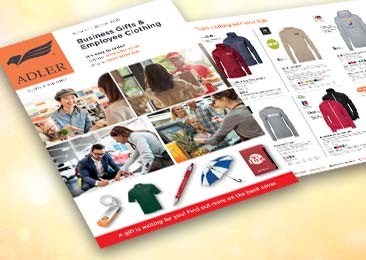 Whether as a widely distributed promotional item or a special gift to your employees, business partners or customers: with your logo printed on it, an organiser provides genuine value and generates brand recognition. Have you already finished planning your branding and are now looking for suitable promotional gifts? Get in touch with us now – with no obligation! We’ll be happy to provide advice and support in your search for appropriate products.